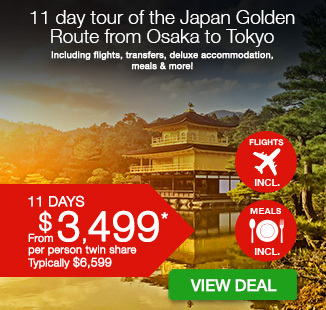 11 day tour of the Japan Golden Route from Osaka to Tokyo including flights, transfers, deluxe accommodation, meals & more! per person twin share |	Typically $6,599! 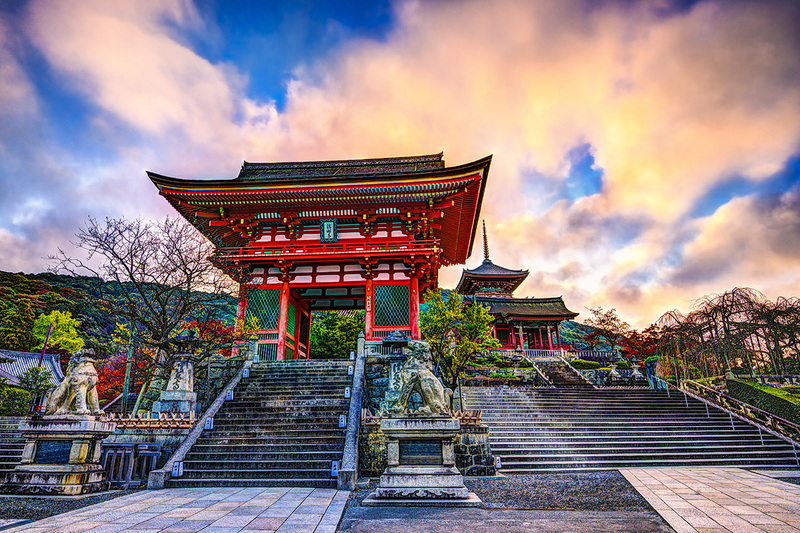 Whether it’s the extraordinary contrast of traditional heritage and contemporary touches, the meticulous and thoughtful people or the exquisite culinary delights, you’ll find little not to fall in love with in Japan. 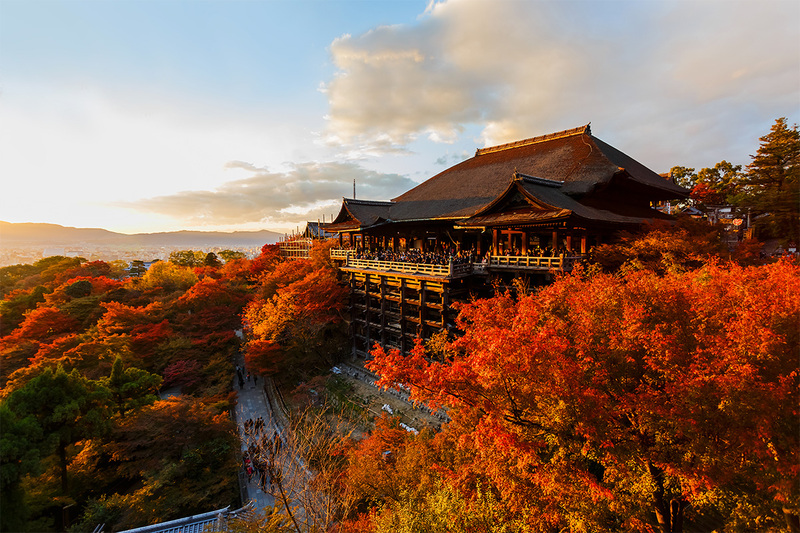 Spend 11 incredible days touring the Golden Route and experience the best that Japan has to offer. 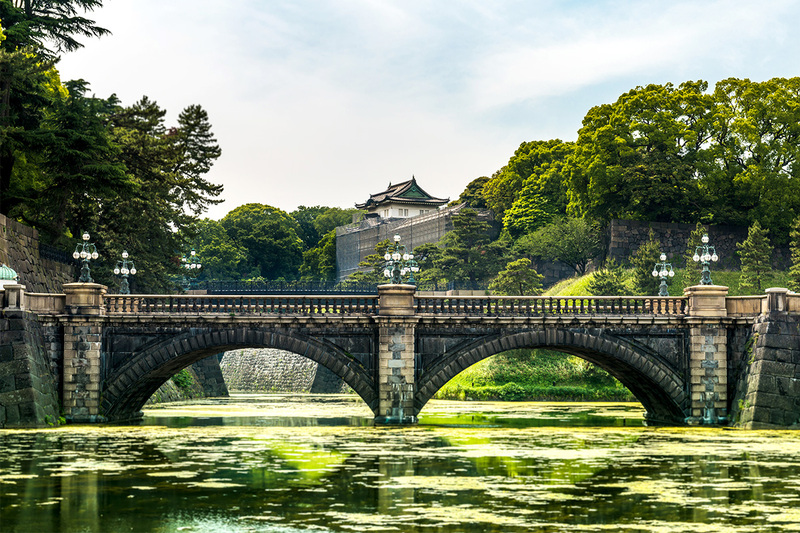 Travel from Osaka to buzzing Tokyo and on your way see brilliant landmarks including Osaka Castle, Nara Park and the Kyoto Imperial Palace. 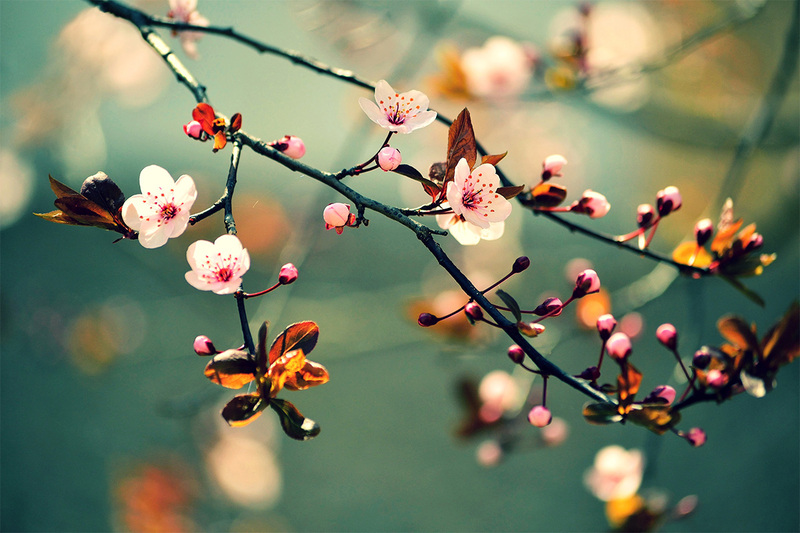 Enjoy a spectacular view of Mt Fuji, ride on the Bullet Train and be mesmerised by the Cherry Blossom season if you travel between March and April. Your package includes return international airfares, transfers, daily meals, expert tour guides, private coach transportation and so much more. At Nexus Holidays, every aspect of your trip is taken care of. All you have to do is relax in comfort and focus on creating unforgettable memories of your holiday. Nexus Holidays have been providing travellers with incredible holidays for more than 16 years. With 13 offices located in Australia, China, Canada and the US, they have experienced and dedicated staff available across several continents and time-zones to provide service to thousands of travellers every year. They focus on offering high quality, authentic and culturally rich experiences to destinations right throughout Asia. Take an international flight from Australia to Osaka. 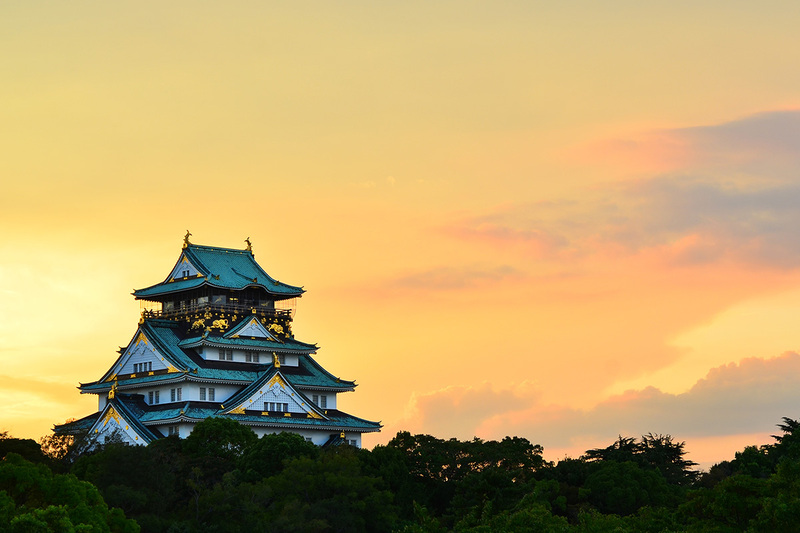 Today, visit one of Osaka’s most famous landmarks, Osaka Castle; which played a major role in the unification of Japan during the sixteenth century of the Azuchi-Momoyama period, before being dropped off at Dōtonbori a street known to exemplify Osaka’s vibrant nightlife. 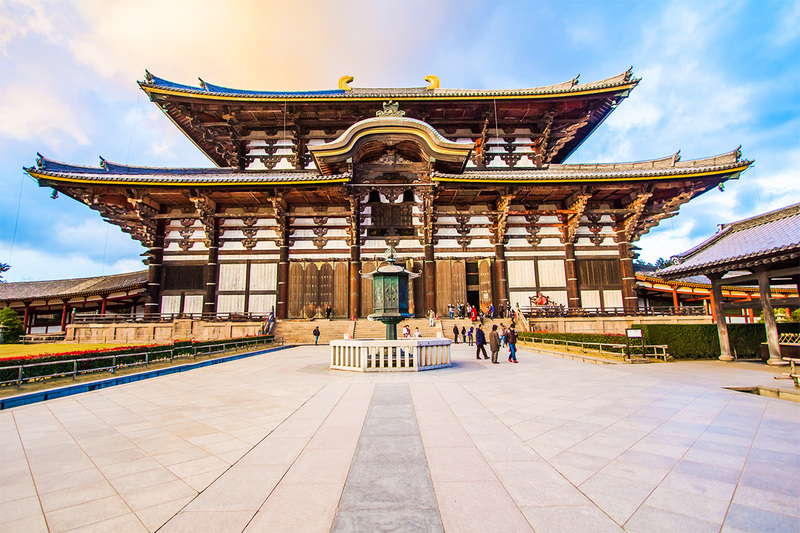 This morning, travel to Nara and visit Todaiji Temple, one of Japan’s most famous temples, with its Great Buddha Hall housing the world’s largest bronze statue of the Buddha Vairocana. 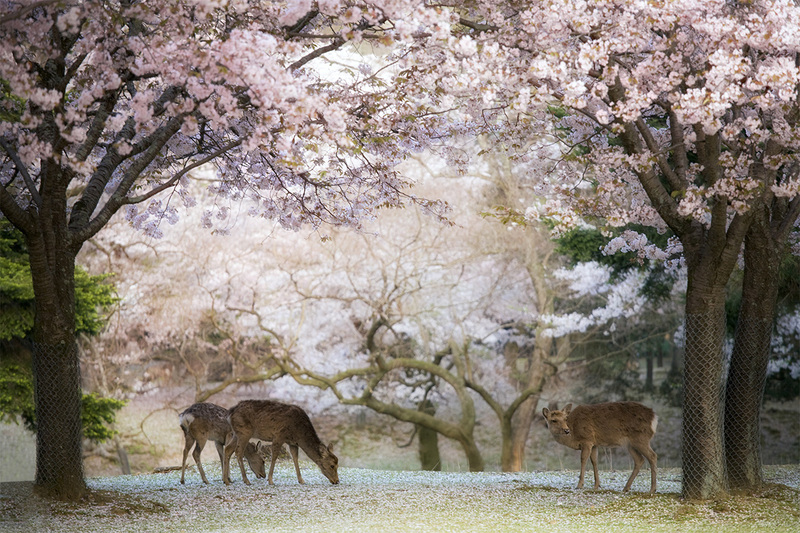 Wander through Nara Park, where over 1,200 wild sika deer roam free before heading onwards to Kyoto, one of the country’s oldest cities. In the afternoon, visit Nishijin Textile Centre and enjoy a traditional kimono show, before capping off your day at the UNESCO World Heritage Kiyomizu-dera Temple and drink to your fortune from the streams of the Otowa Waterfall. This morning, visit Nijo Castle, the Kyoto residence of the Tokugawa Shogunate and Kinkakuji: Golden Pavilion, a Zen temple and World Heritage site with two doors covered entirely in thin layers of pure gold and detailed architecture incorporating three distinct styles of Shinden, Samurai and Zen. Also visit Togetsu Bridge, the landmark of Western Kyoto’s Arashiyama District for over four hundred years, before travelling onwards to Mount Fuji by bullet train (Max. speed 320km/h). Today, visit Oshino Hakkai. Known as the Springs of Mount Fuji, the eight ponds are fed by melting snow filtering down from the slopes of nearby Mount Fuji, through porous layers of lava, resulting in very clear spring water that is revered by the locals. 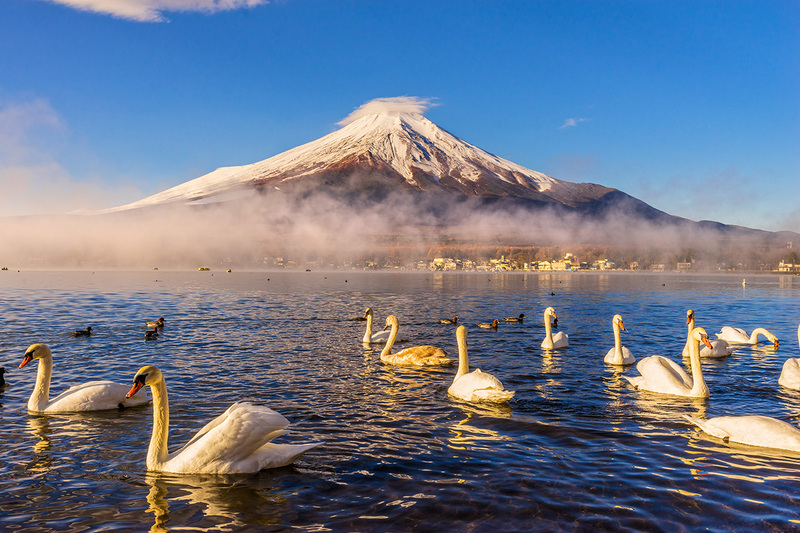 Later, visit Gotemba Peace Park to capture a breathtaking view of Mount Fuji, before taking a cruise on Lake Ashi, and savour the numerous delights of nature. Visit Owakudani Valley, an active volcanic zone with hot springs and hot spring rivers. Also visit Hakone Shrine. Standing at the foot of Mount Hakone along the shores of Lake Ashi, the shrine buildings are hidden in dense forest, its location given away only by the temple’s huge torii gates. This morning, visit Odawara Castle. 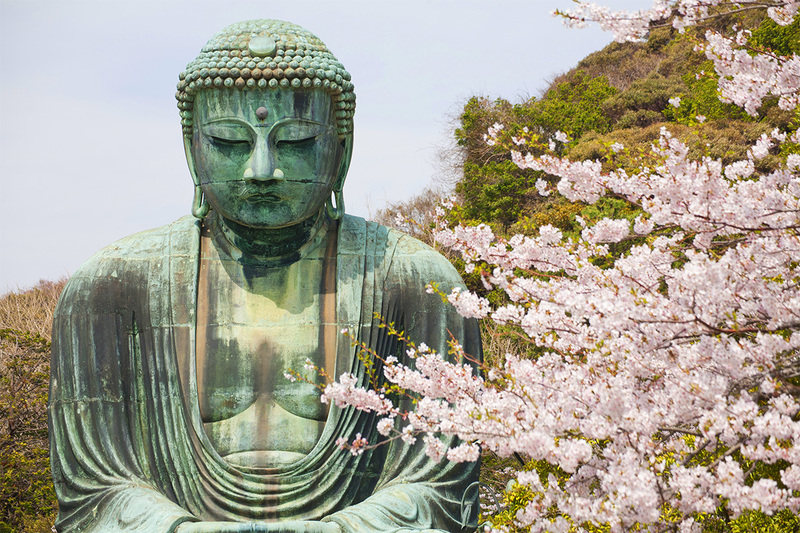 Then travel to Kamakura and visit Daibutsu, the Great Buddha which is the second tallest bronze Buddha statue in Japan, surpassed only by the statue in Nara’s Todaiji Temple. Before back to Tokyo, in the afternoon to visit Yokohama China Town, the largest Chinatown in Asia. Spend today free at your own leisure. You may spend a day in Tokyo Disneyland or DisneySea (admission $120). Or alternatively, you can join our wide range of optional programs (Tea Ceremony, Pottery-making Experience, Golden Joinery, Kimono Photo Shoot, Cooking Class). All activities are not guided and transportation is self-arranged. Visit Meiji Shrine in the morning, dedicated to the deified spirits of Emperor Meiji and his consort, Empress Shoken. Later, stroll through the Asakusa Kannon Temple, one of Tokyo’s most colourful and popular temples and browse for souvenirs at Nakamise Shopping Street. Relax on a Sumida River Cruise. Your last stop today is Tokyo Tower, before heading to a hotel near Narita Airport. On the next morning after breakfast, if you are flying Cathay Pacific, you will be transferred to Narita Airport (approx 10 min). If you are flying China Southern Airlines, you will be transferred to Haneda Airport (approx 70 min). Spend the morning at your own leisure before transferring to the airport. Ride on the spectacular Bullet Train! ^Taiwan extensions are not available. Extensions payable direct to Nexus Holidays at time of booking. Interstate Surcharge: Departing Brisbane & Adelaide $300, Perth $600 per person. Payable direct to Nexus Holidays at time of booking. Single Supplement: $800 single supplement surcharge applies. Payable direct to Nexus Holidays at time of booking. Child Price: Same price as adult. Cathay Pacific Upgrade: A surcharge of $500 per person applies. Payable direct to Nexus Holidays at time of booking. Pre/Post Tour Accommodation: From $350/room/night (based on twin-share). Payable direct to Nexus Holidays at time of booking. Nexus Holidays is open Monday to Friday from 9:30am – 5:30pm, Saturday 10:00am – 3:00pm and available via email only Sunday. 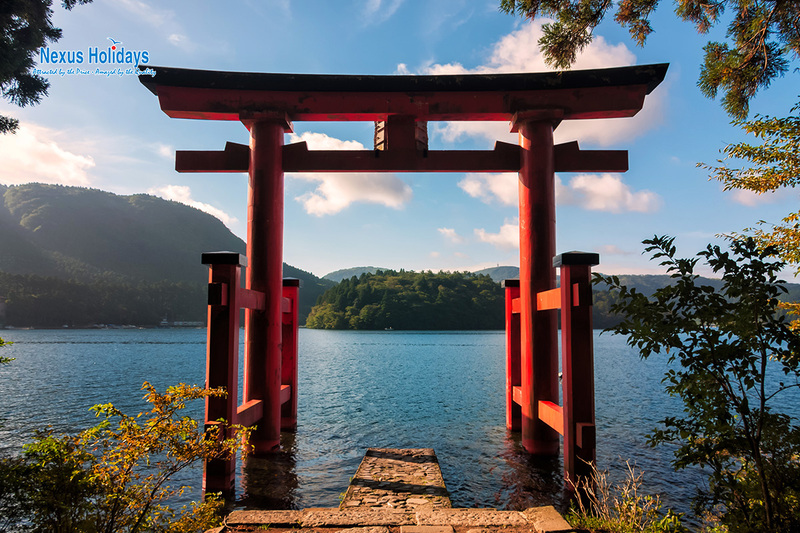 Whether it's the extraordinary contrast of traditional heritage and contemporary touches, the meticulous and thoughtful people or the exquisite culinary delights, you'll find little not to fall in love with in Japan. 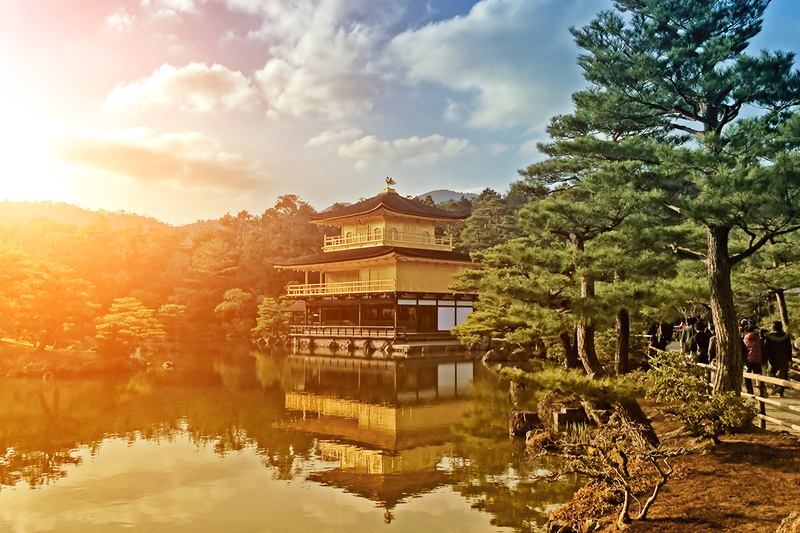 Spend 11 incredible days touring the Golden Route and experience the best that Japan has to offer. 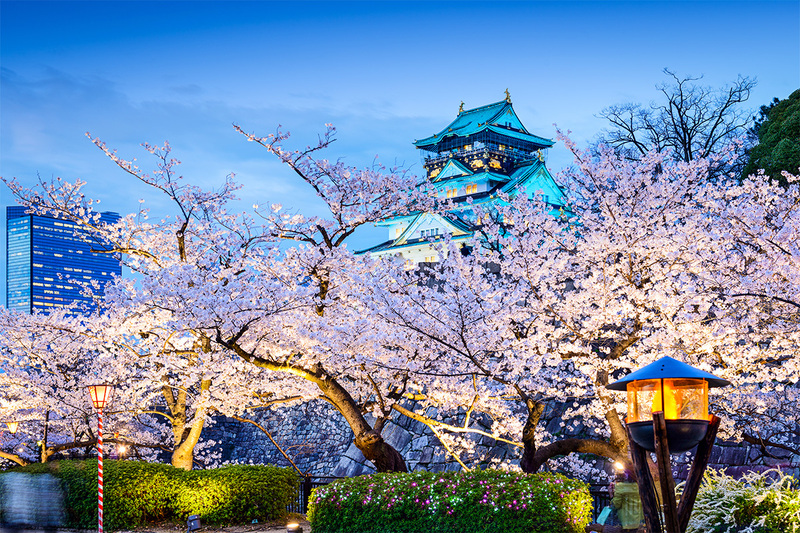 Travel from Osaka to buzzing Tokyo and on your way see brilliant landmarks including Osaka Castle, Nara Park and the Kyoto Imperial Palace. 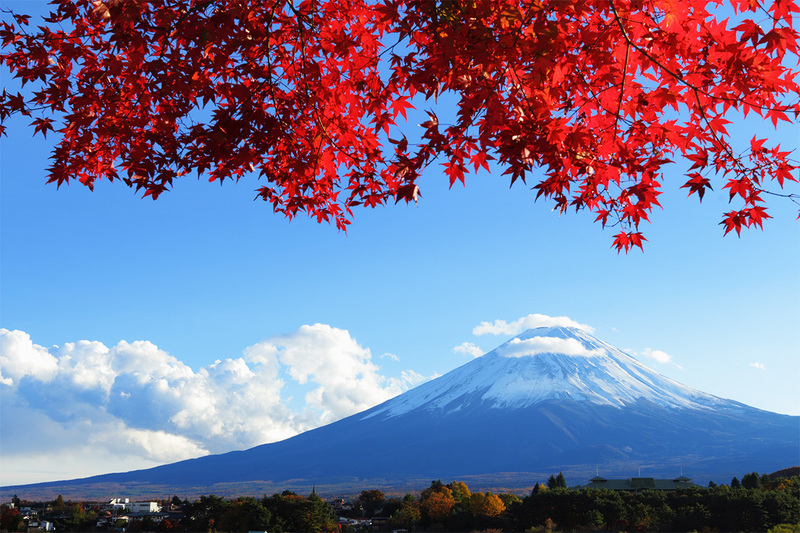 Enjoy a spectacular view of Mt Fuji, ride on the Bullet Train and be mesmerised by the Cherry Blossom season if you travel between March and April. After your purchase is complete, you will be emailed an order confirmation with instructions on how to finalise your booking using the Nexus Holidays electronic booking form. Your booking is not yet confirmed. You must complete the Nexus Holidays electronic booking form by 30 May 2017 (or 30 days prior to departure, whichever comes first). As departure dates are subject to availability, we recommend submitting the booking form as early as possible to secure your desired date and avoid disappointment. Real time availability is accessible on the booking form. On the booking form, please ensure you submit ALL traveller’s Webjet Exclusives voucher codes (1 unique code per person) and passport details. The voucher codes begin with the letters “AU” and are contained in the PDF attachment to the order confirmation email. Your travel date is not confirmed until you submit your Nexus Holidays Booking Form. Once this is submitted, Nexus Holidays will contact you directly in relation to your booking request. Your Japan tour is subject to availability at the time of your booking. We advise you to book early to avoid disappointment.